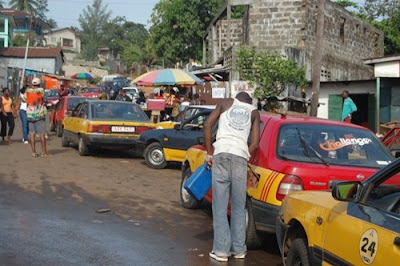 Following the recent global increase on petrol, Sierra Leone was said to be paying more for it. It has been customary a thing here for us to be the last in everything especially in terms of development but here we are today leading the fuel crisis. Majority were shocked for this big news whilst others were not too surprise to hear this. The problem now lies with those who had to deal with it and from my own point of view, we are all involved and this will surely affect even the youngest baby. Looking at this increase, I took time to talk to few vehicle drivers- lets say Taxi's and Poda Poda drivers and also those selling it in some filling stations. "Albert" a taxi driver stationed near the Congo cross police station said he just cant afford it so he has no choice but to buy Jebu jebu fuel( black market) the first few morning hours till he has enough to buy more gallons in the fuel stations. Reasons for this according to him is that, he takes the petrol on loan and then pay after making few runs, this you cant do in the fuel stations. There are several disadvantages having it this way, one, not a full gallon, you have to struggling getting this in to the car etc. But according to him this is his best idea. He sometimes lost his passengers if the car happens to run out of gas. "Pa Mata" one of the oldest struggling taxi driver I knew running the Signal hill Wilberforce route with his old taxi said I just cant meet this at all. My passengers are always making mention about my old car and it does burn a whole lot of fuel. Most say they can't pay the exact taxi fare and for fuel to increase I just cant run it. He said he would have to find money somewhere to have enough gas before running it. Alimamy Bangura, the Manager at the Abardeen filling station says the increase in fuel had made sales to drop for them. They too had no choice but to do what the boss says. My fear is, whenever there is an increase in petrol, all other commodities takes a different higher level. The last view weeks we had sensed the drastic increase in our staple food rice, not talking of nut oil and palm oil. Even the list washing soap, Baby food and baking flour is on the increase. ROO my little boy can snack on a one thousand leones piece of bread and then ask for more in few minutes. These are the effects that am talking about. Should things continue like this, what would it be like? All this talks of Freetown. An increase in Freetown gives more room for increase on everything in Kabala and other sub areas around the country. This I have no doubt of. Now, all those who can't meet to the taxi fare increase, either walked their way to town or squeezed like sardines in the crowded Poda Podas. And this is no safe journey even if you are making a two hundred meters drive, not talking of the bad sweats and different odors in it. This is what it is like and we pray not for more increase in this precious liquid. We have had enough. THE ABOVE REPORT IS FROM JAMES, OUR NAZARETH HOUSE DIRECTOR IN FREETOWN. FOR PRIVACY REASONS, THE NAMES OF TAXI DRIVERS HAVE BEEN CHANGED.